One thing is absolutely certain, if you’re in a small business; what you sell, you must ship. Shipping becomes an indispensable part of any small business, if you’re dealing in any kind of product. It’s a downright necessity, and when it comes to shipping, one of the first things that comes to mind has to be UPS. 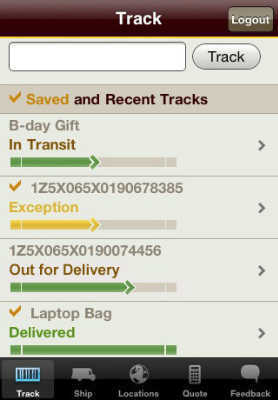 And that’s why we’re taking a look at the UPS Mobile app. 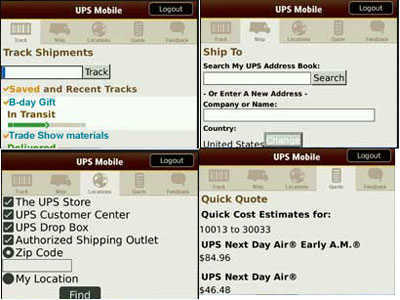 UPS Mobile gives you a complete package of options. You’ll get to search your current tracking numbers, getting complete pictures of the status of shipments in transit. You’ll be able to generate shipping labels, find shipping locations (even being able to map them and use your GPS with that map so you’re never very far from a shipping location), and even estimate shipping costs right from your mobile device. Thankfully, the app itself is pretty easy to use. The menus are simple to navigate and the whole experience is not only usable when you’re online, but also when you’re off, so you won’t lose functionality with your internet access. And of course, there’s plenty of great features in here for anyone who deals in shipping. Whether you’re expecting a package or sending one out, you’ve got most everything you need right here. There are downsides, of course–the biggest among them is that you have to manually enter all your tracking numbers every time you want to track a package. And UPS tracking numbers are no small item, so this can get downright annoying.